China’s ‘Belt & Road’ initiative, a network of overland road and rail routes and maritime links meant to transport oil and gas from China to Europe, has been described as a 21st century silk road. But how long can it last? It has the potential to mark a major geopolitical shift, making Eurasia the hub through which goods and commodities are transported between Europe and China. Committed funding to belt and road projects now stands at $1.2 trillion, most of which comes directly or indirectly from the Chinese state. At the annual conference of the International Association of Ports and Harbours in Baku last week, officials from European ports and the European Commission rubbed shoulders with their counterparts from China and Southern Asia. 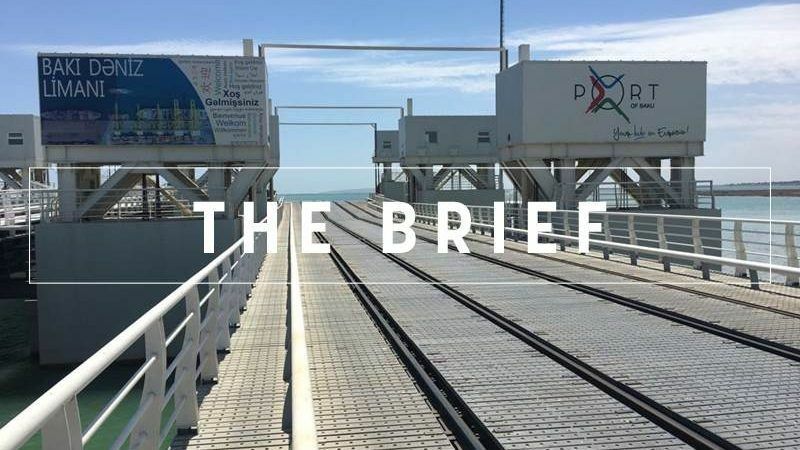 Anxious not to be left out, the Commission is offering the prospect of funding from the European Investment Bank and TEN-T transport projects, but the cash involved is peanuts – and with more strings attached – compared to China’s largesse. None of the 66 countries on the belt and road network have designs on EU membership, but the EU would be foolish not to engage with them. “The real issue is how does the east look towards Europe and what is going to be the main gateway,” said Patrick Verhoeven, the IAPH’s managing director. The game changer, he pointed out, was when China’s state-owned shipping company Cosco bought terminals in Greece. “That changed the whole perspective of where the gateway of Europe is”. At the centre of the bunfight, Azerbaijan’s capital sees a golden opportunity to position itself as the South Caucasus answer to Dubai – a free trading hub replete with ports, rail and airports. This, in turn, is one reason why EU-Azeri relations have rapidly warmed up, after having been nearly frozen in 2015. Talks on a new trade pact between Brussels and Baku, which started in 2016, are likely to bear fruit within the next 18 months, insiders tell EURACTIV. The obvious main benefit to the EU of belt and road is that it would make it easier for Europe to increase its imports of oil and gas from Azerbaijan and reduce its reliance on Russia. But the transition is unlikely to be seamless as it sounds. How long can the initiative last? Infrastructure is hugely costly, return on investment is slow and private companies will not invest unless they are heavily subsidised. China says it can keep pumping money in for another ten years. What happens after that is unclear. The other ‘known unknown’ is whether a historically fragile region, with Russia to the north and Iran and Afghanistan to the south, remains stable. But at a time when the US appears to be retreating inwards and toward trade wars and walls, the construction of the 21st century silk road is an opportunity to break down barriers between east and west, not to mention a chance to recast the geopolitical map. The new long-term EU budget for 2020-2027 could prove to be a problem child for the EU. Its approval before the European elections is looking increasingly uncertain, rotating EU presidency holder Bulgaria admitted. Time is running out for Poland, as the Commission warns the country could move closer to unprecedented sanctions next month, unless Warsaw makes “a lot more progress” in the row over controversial court reforms. In the latest episode of the long-standing name dispute between Athens and Skopje, Bulgaria’s EU Presidency sees an ‘opportunity’ at a crucial meeting due in Sofia later this week. In the name game over the next possible pick for Commission chief, it is not too early for Commissioner Michel Barnier to throw his hat in the ring, writes Gilles Merritt. The EU Ombudsman is keeping her eyes on the Martin Selmayr scandal and has opened an investigation into the controversial promotion of Commission chief Jean-Claude Juncker’s right-hand man. The EU wants to ban disposable plastic dishware and cutlery. But the Commission’s new plastic ban threatens to fall flat as critics say it is pointless and manufacturers are unimpressed by the idea. While cars and vans in Europe have had CO2 limits for some time, trucks have avoided the same fate. Ahead of a new proposal later in the week, the truck industry now has to brace itself. Turkey’s president visited the UK today and even got to meet the queen. But a picture taken with star footballer Mesut Ozil has landed the Arsenal player in hot water. A new proposal on CO2 limits for trucks will be presented to the Commission’s college.